I have to thank all my guests who help on Simply Modern Mom for the last two months while I took a maternity leave with Eve. We’ve had some amazing guests and brilliant posts. I loved them all. I always enjoyed seeing the things other bloggers come up with because they are full of creativity. Today is our last guest post with the fabulous Megan of Not Martha. She is sharing this yummy cinnamon roll pancake idea. My girls would love these. Cinnamon roll pancakes are marvelous, they capture the deliciousness of cinnamon rolls but don’t require that you plan in advance. I learned about these pancakes last year and it only took us a few batches to declare them a dangerous amount of sugar that early in the morning. So I decided to scale them down to something closer to the size of a cinnamon roll. These miniature versions are a delight on your breakfast plate. 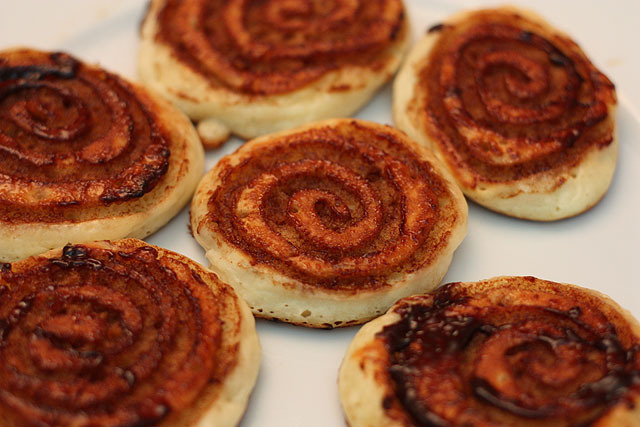 To make them you start your pancakes and squeeze a cinnamon and butter mixture in a spiral on top. I simply snipped a corner off of a zip top bag, but you can use a pastry bag if you have one handy. Use the fluffiest pancake recipe you have (I simply used Bis. Once the pancakes are ready flip them over as normal. When they come from the pan there will be a craggy cinnamon channel left behind. It’s delicious, crunchy and holds the cream cheese glaze perfectly. 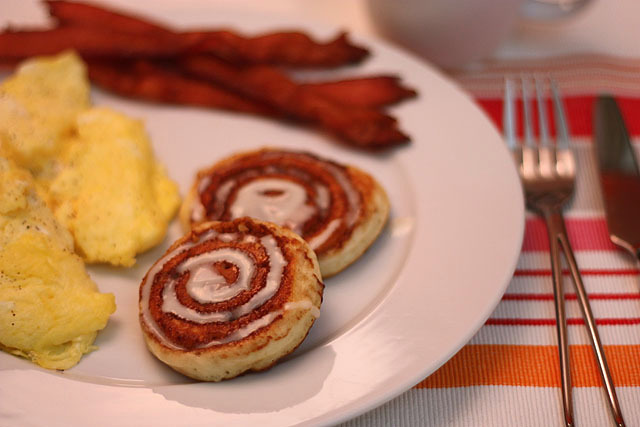 I first learned about these cinnamon roll pancakes over at Big Red Kitchen where you can find the recipe and more detailed instructions. 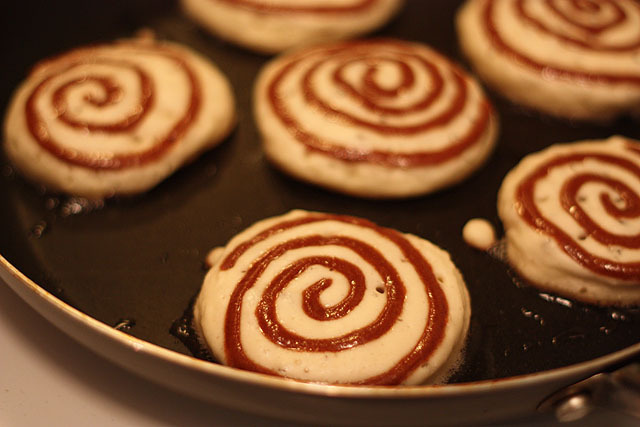 Recipe Girl recently posted a recipe for pumpkin cinnamon roll pancakes. I insist you try to makes these soon, you won’t regret it.